Fresh spring salad mix is one of my favorite things to get at the farmer’s market. It’s a mixture of several varieties of lettuce, arugula, and spinach. Sometimes I find herbs like parsley and dill are added to the mix. 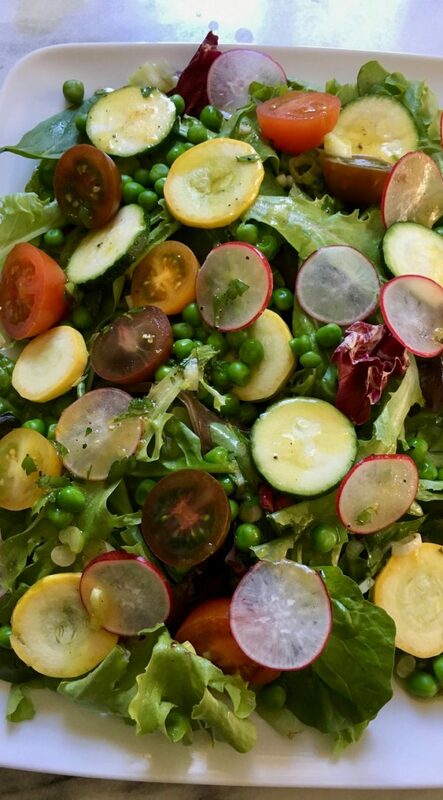 Then when I see fresh yellow squash, radish, peas, mini heirloom tomatoes and zucchini, I get inspired to make a salad. When they are in season, I like to take advantage of their fresh flavors and color. In this spring salad, you can pick any mixed greens you like. Wash it well and use a salad spinner to dry it. You can also use store-bought pre-washed salad mix if you prefer. For color and crunch, add chopped fresh yellow squash, zucchini, mini heirloom tomatoes and radish. The sweet green peas need to blanched for a few minutes and drained well. Dry it with paper towels to get the extra moisture out. The simple lemon dressing made of olive oil and lemon juice highlights the individual flavors of the ingredients. A little honey, salt and pepper balances it out. To put the spring salad together, use a big rectangular platter or low bowl. First, spread a layer of mixed greens on the platter. Next, add a layer of chopped yellow squash and zucchini. Then add the green peas. The chopped radish goes on top of the peas. Lastly, add the heirloom tomatoes and top with any herbs like chopped parsley, dill, or basil. 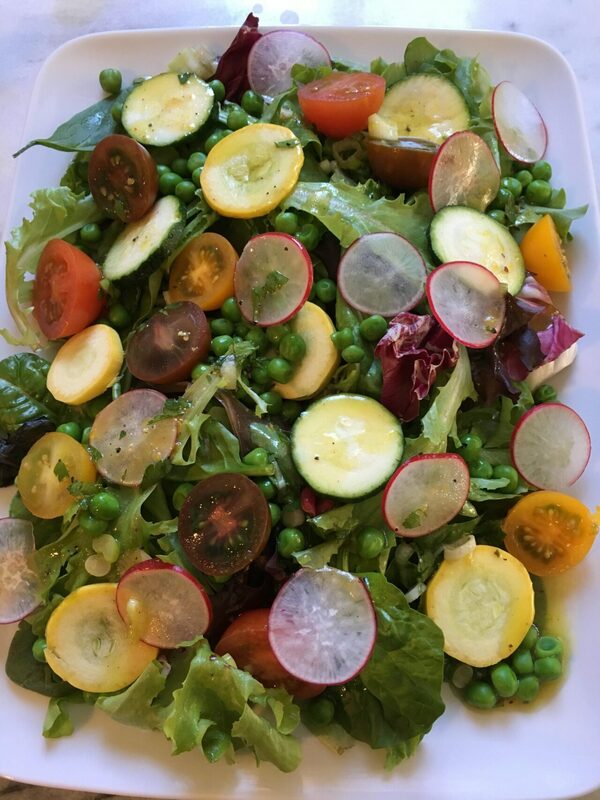 This spring salad with fresh spring vegetables is a beautiful salad to make and serve your family or at a party. All the flavors of spring are in this delicious and colorful salad. It’s easy to make and is ready in a short time. I’m sure everybody will love it. Happy Spring! This colorful spring salad has all the flavors of spring and a simple lemon vinaigrette. Boil water in a small pot on high heat. When it starts to boil, lower heat to medium and drop the peas. Blanch peas for 3 minutes. Transfer peas in a colander and wash with cold water to stop the cooking process. Let it drain. Dry peas using paper towels. Make the lemon vinaigrette: In a small bowl whisk together the lemon juice, lemon zest, honey, mustard, salt and pepper. Slowly drizzle the olive oil while whisking. Stir in green onions. Compose the salad: Spread the mixed greens in a big rectangular platter or low bowl. Add the rest of the vegetables in this order: zucchini and yellow squash, peas, radish, and tomatoes. Top with fresh herbs like parsley, basil, or dill. At serving time, drizzle dressing on the salad.